I am three times a lady. I want you to remember that. No matter what you read in the coming minutes, just think ‘Three times a lady’. Time one – I have ‘trained’ myself to wear 6 inch heels, with little fear of tragedy a la sprained ankles and I can actually walk in them. Time two – I had a pedicure today, and my toe nails will soon sport a fresh coat of red nail polish. Time three – I know what the word ‘decorum’ means. behavior in keeping with good taste and propriety : you exhibit remarkable modesty and decorum. • etiquette : he had no idea of funeral decorum. So now we’ve established what you ought to remember, I can tell my tale. 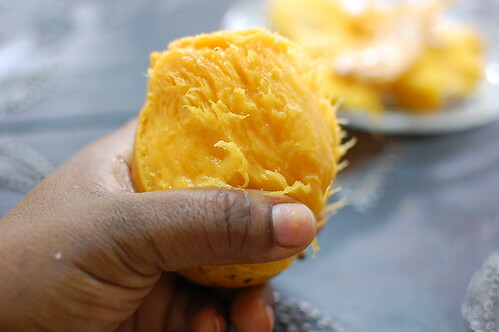 I ate my first mango of the season on the 21st of February and if you are lauding my wonderful memory, its because I read it off my dental bill. For on that fine day, which began bright and clear, sunlight warming my heart, I had to make a trip to the tooth doctor for the extraction of an ‘impacted’ wisdom tooth which left me with throbbing head and a fine measure of pain. On that morning, as I head to the Dentist San Diego office, a warm, inviting smell awakens my senses. Considering I haven’t slept well for 4 nights, this might all be in my subconscious. It is the sunny smell of custard – clear as day in my mind and nostrils. Bird’s sunny yellow ‘pap’, to be exact. I imagine pools of evaporated milk, with sugar crystals drowning and then my mouth open, glad to receive spoon after spoon of pure delight. I understand why Sally loves her custard pie! And I think, perhaps that this is a sign of the dental treatment that will follow – I don’t know if I should be happy or sad. I’m already in pain so there’s not much to worry about there. 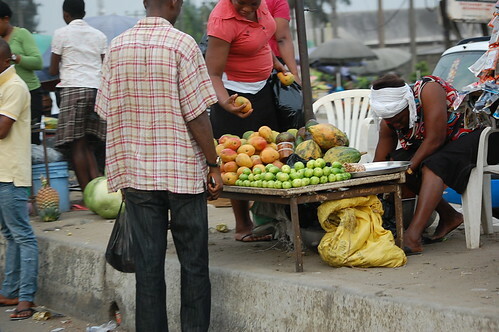 Lots of fruit are sold in wheelbarrows….aka mobile stalls! Fresh from the dentist and on the way home, with a warning not to eat anything ‘hot’, my hopes of having custard are squashed. I opt for mangoes instead. I know this might not be the logical next choice but…… the mango and a bowl of custard have many a thing in common. Bright yellow hues, some liquid to their name and most importantly, both are loved by me. I see the first batch of the season – piled high on enamel trays in yellow and red pyramids and I decide this is a worthy substitute. 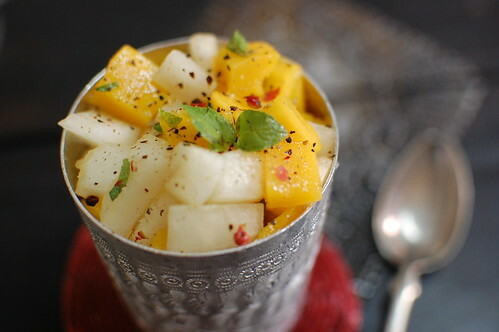 But I’m not thinking about making a delightful mango salad, or drying them, or even whipping up a lassi. 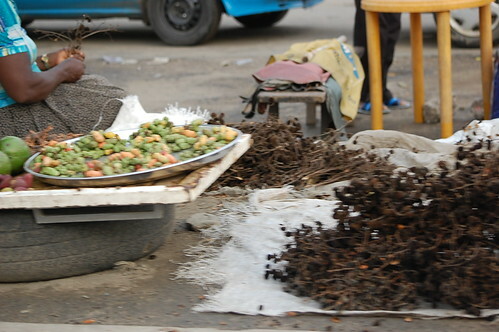 All I can think about is eating one, for want of a better word. Washing it, tearing the thick flesh away from the juicy pulp and chomping till my teeth hit stone. And so I stop by a lady, sitting quietly on a wooden stool, haggle a bit and leave with a black plastic bag, heavy with 6 mangoes. I smile. 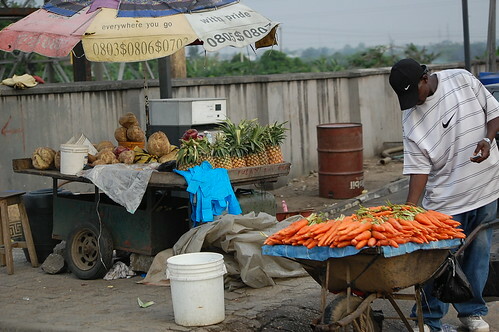 Its interesting how obvious things in ‘season’ are to me in Nigeria this spring. As crocuses and tulips and daffodils sprout in the Netherlands, and across Europe. As cherry blossoms carpet tree bases in Japan. 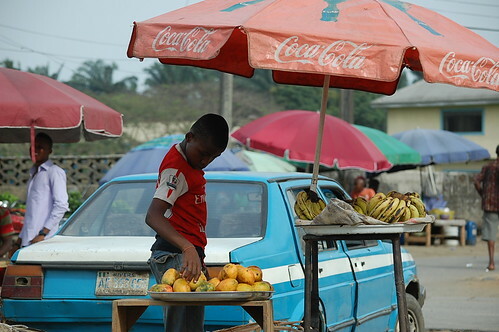 In Nigerian everything is ‘open air’, from mechanic workshops to roadside stalls and umbrella-shaded food stands – you see everything. You notice the changing seasons from street corners and roadsides, without even meaning to. 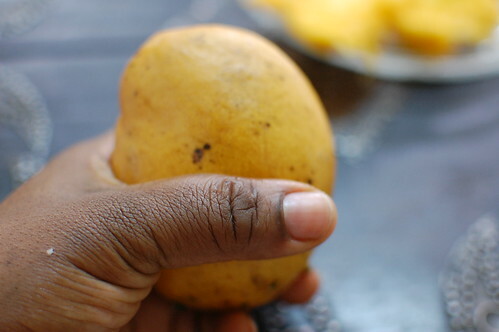 You see when the bean-shaped mangoes partly replace oranges, you smell the sweet, mint of pepper fruit in late March when trees are ripe with pods. You often see small pyramids of hot, yellow peppers and so the landscape changes. 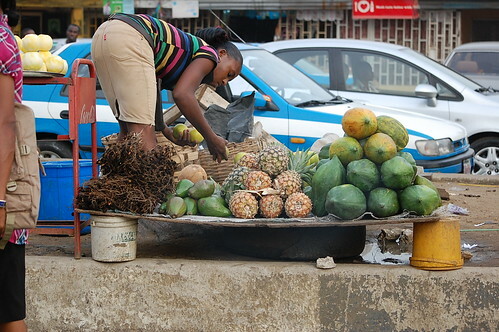 Pears, african cherries, sweet tamarind, piled high on thin stalks when I walk down the street, or drive by and I’m reminded, this is the time, to eat and enjoy them, the best time when they are at their peak. 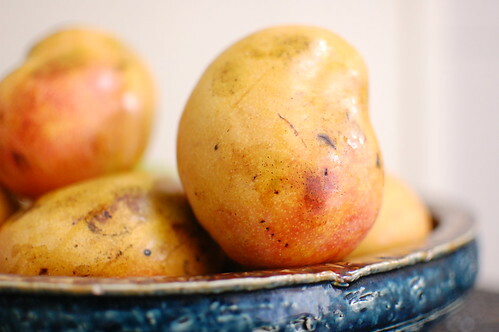 At home, I sit myself upon a wooden stool, one washed mango in hand as the skies turn grey. I marvel at the way the rain approaches like a noisy freight train, passing through the night. Its intrusion welcome but still its arrival is like that of a welcome stranger. One minute thundering, the next whimpering….and then a repeat. ‘Make up your mind how you want to fall’, I’m almost tempted to shout back but I don’t. I sit comfortably instead, and stare at the rain and the mango trees. 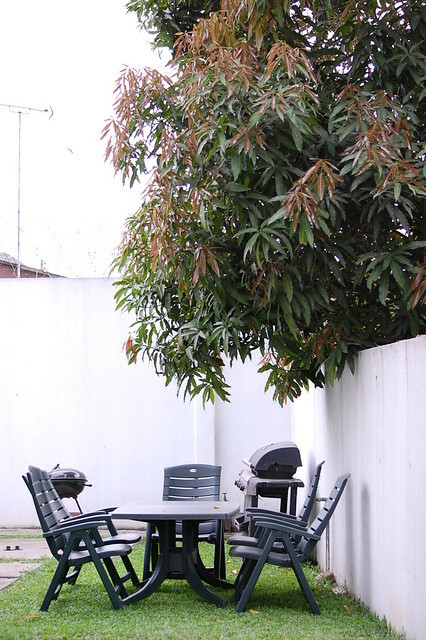 The mango trees stand, towering in their leafery and greenage, roots and trunk dug deep and spread wide!. Every now and again, the skies belch and fart as the air thickens with misty water. The rain beats down hard, with such fury that I can do nothing but stare at it, its warmth encased in long columns of water. The harder it falls, the more I am reminded of algebra and mathematics as the drops form columns. The heavy ones come down hard…and straight, hitting the floor with measure, while the thinner columns sway with what little there is of tropical breeze and thus form the perfect hypotenuse to the straight drops. When the rain is done venting its rage and frustrations, filling gutters and turning roads to rivers, the skies go calm and the leaves shine with a polished green, ready to garnish the earth. 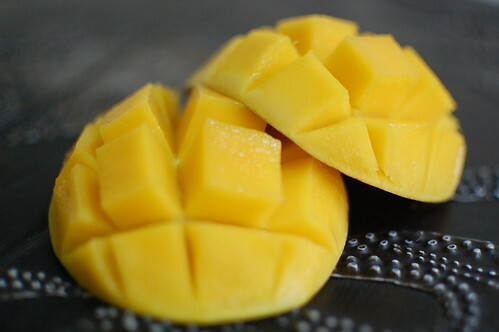 My mango is waiting. And I waste no more time musing about the weather and its vagaries. 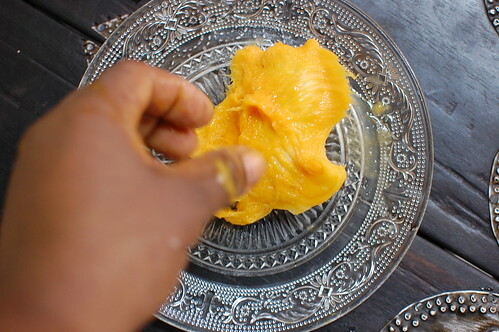 When I eat a mango, I often begin by chewing on the edible skin but more often than not, I tire of that. It becomes too hard work when I know juice awaits me. And before long, I tear off strips of skin, port them in the bowl that I have to hand and finally, the meat is exposed. I bite, pull of pulp, chew and swallow. And as I do so, I admire the yin -yang qualities of this fruit. I coast from one sweet side, enjoying the fruit sugars and before long, I’ve arrived at the tart side and then back to the sweet, the not-so sweet and then sour. In the end, the pulp is all gone and I am left flossing my teeth with the fibrous things that remain, that cling to the flat stone. All this while, orange juice streams down my arms. When I notice, remember, care, I lick the juice. I wipe my mouth. And here in comes the decorum bit. 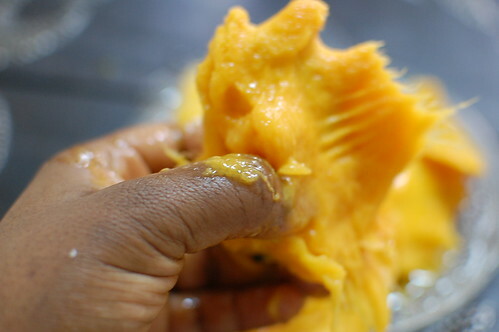 Yes I could finely slice cheeks of my mango. And then make a fine grid out of them, ending with perfect squares of fruit. And yes, that has a place in history. Yes I too, could use the three-slice plan to ‘eat’ my mango to avoid getting juice all over me. And I may try that someday. 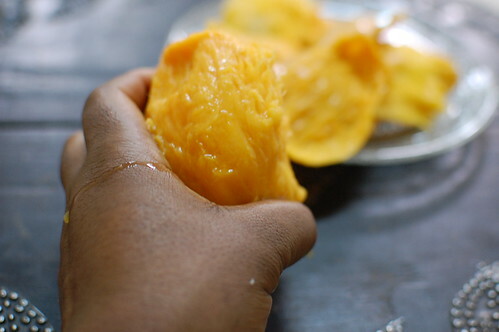 But its the way I ate mangoes growing up that remains the ultimate in satisfaction for me. No cares, no concerns, no airs, and yes, no grace (sniff, sniff). This is all fulfillment. This is nourishment after a game of hopscotch, skipping rope, jumping in mud. This is pleasure direct, from cooking with hibiscus leaves and tin cans. Swimming in the rain and catching tadpoles. This is childhood. This is perfection. This is my mango and me. And I’m still a lady…..me thinks!